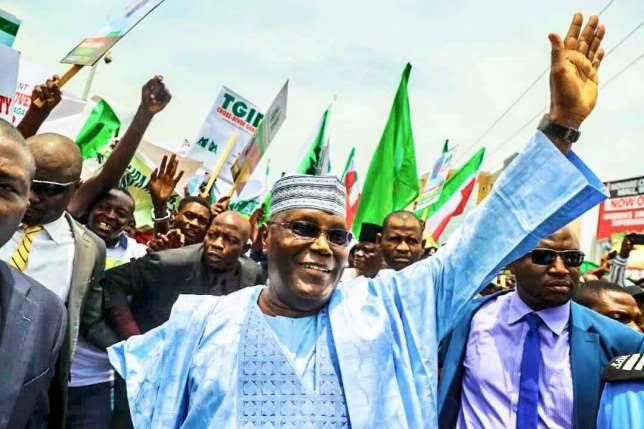 Following the landslide victory of Alhaji Abubakar Atiku, GCON as the flag bearer of the People’s Democratic Party (PDP), information available to us reveal that the jostling for who will be his running mate has reached fever-pitch. According to sources close to Atiku, he has referred the question of who will be his running mate to the party elders to decide. This, many believe, would serve to heal any wounds that may have arisen from his landslide victory over Governor Aminu Tambuwal who had been enjoying the unhinged support of Governor Nyesom Wike of Rivers State and the state delegates loyal to him. There are many eminent PDP members across the country who are qualified for the role but discussions with top PDP apparatchiks at the venue of the just concluded PDP National Convention revealed that the front runners for the position of Vice Presidential candidate are Chief Gbenga Daniels, Governor Nyesom Wike, Dr Peter Obi, Dr Ngozi Okonjo Iweala, Gov Seriake Dickson and Gov Ayodele Fayose. Chief Gbenga Daniels is a former two-term Governor of Ogun State and the Director General of the Atiku Campaign Organization who was able to garner the delegates from the south west states, except Ekiti State delegates, to deliver block votes for Atiku at the primaries. He is believed to be more suited for the job as he would be able to reduce the votes to and the dominance of the All Progressives Congress (APC) in the south west states. He would also balance the influence of the current Vice President to President Buhari who is also from Ogun State. Gov Seriake Dickson of Bayelsa State was the only Governor that openly supported Atiku and mobilized support from fellow PDP Governors, in direct opposition to people like Wike who publicly supported Tambuwal. Governor Dickson's unalloyed support for ATIKU also contributed to Atiku’s recent victory as the presidential candidate of the PDP. Dickson has been a stabilizing factor in the Niger Delta and is widely accepted as a grassroots politician with strong ties with the Yorubas being that his grandmother is from Ogun State. His giant strides in various sectors in Bayelsa State continue to stand him in good stead as a purveyor of peace and development to the people in general. Dr Ngozi Okonjo-Iweala is the renowned Finance Minister and Coordinating Minister of the Economy in President Goodluck Jonathan’s Government. She comes with immense experience and capacity together with a largely unblemished public service record. Though not a politician, her candidacy should put presidential hopefuls from the south east states at ease as she would not be competing with them to take over from Atiku at the end of his single term plan. She would also help to rein in sympathetic votes from Nigerian women across party lines and ethnic or tribal affiliations. Gov Nyesom Wike is arguably the latter day leader of the PDP who has fought to steady the course of the party in the last turbulent years after the loss of the presidency to the APC. Though he did not support Atiku in the primaries, pundits say that his control of the party systems through his appointed Chairman- Chief Uche Secondus is very strong. Gov Ayodele Fayose is the current Governor of Ekiti State who stepped down from the presidential primaries race ostensibly to support Tambuwal. Despite the fact that his candidate lost the governorship elections to the APC candidate, pundits say he still commands a lot of support in the south west states. Fayose, though considered a rabble rouser by a cross section of the society for his many verbal engagements, should therefore help the PDP garner votes in the south west states as Vice Presidential Candidate to Atiku. Last but not the least is Dr Peter Obi. He is the immediate past and very successful governor of Anambra State. Obi brings economic sagacity and an unblemished public service record to the table but may raise fears from other possible successors to Atiku at the end of the single term as being vice president would put him in pole position to take over.